Child was a favorite of audiences from the moment of her 1962 television début on public television’s WGBH in Boston, and she was a familiar part of American culture. Her appearance on a book review show on WGBH led to the inception of her first television cooking show after viewers enjoyed her demonstration of how to cook an omelette. The French Chef had its debut on February 11, 1963, on WGBH and was immediately successful. The show ran nationally for ten years and won Peabody and Emmy Awards, including the first Emmy award for an educational program. Though she was not the first television cook, Child was the most widely seen. She attracted the broadest audience with her cheery enthusiasm, distinctively charming warbly voice, and unpatronizing and unaffected manner. 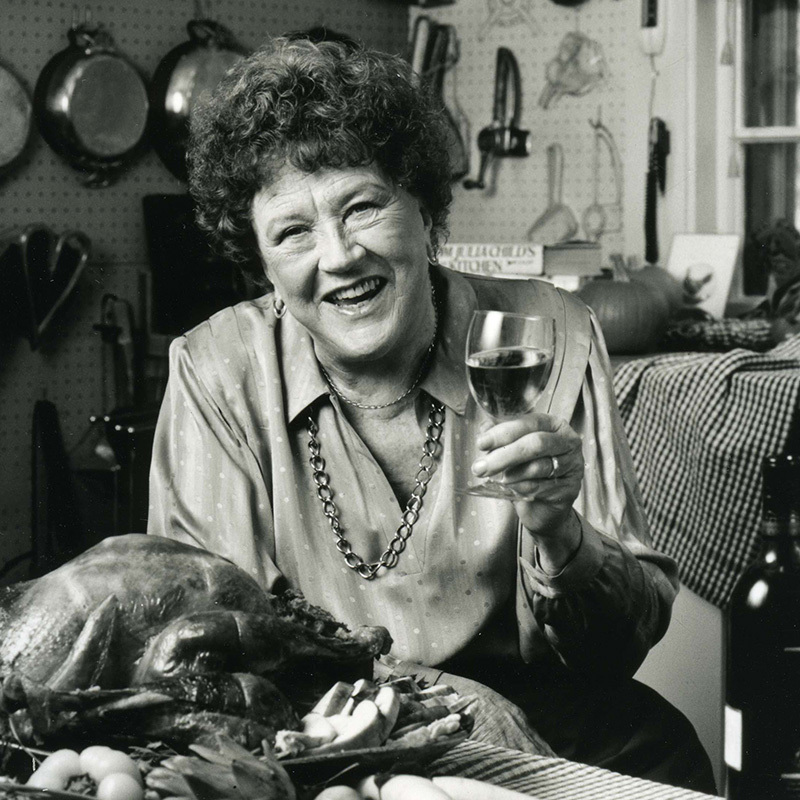 In the 1970s and 1980s, she was the star of numerous television programs, including Julia Child & Company, Julia Child & More Company and Dinner at Julia’s. Child starred in four more series in the 1990s that featured guest chefs: Cooking with Master Chefs, In Julia’s Kitchen with Master Chefs, Baking with Julia, and Julia Child & Jacques Pépin Cooking at Home. Julia Child’s kitchen, designed by her husband, was the setting for three of her television shows. It is now on display at the National Museum of American History in Washington, DC. Beginning with In Julia’s Kitchen with Master Chefs, the Childs’ home kitchen in Cambridge was fully transformed into a functional set, with TV-quality lighting, three cameras positioned to catch all angles in the room, and a massive center island with a gas stovetop on one side and an electric stovetop on the other, but leaving the rest of the Childs’ appliances alone, including “my wall oven with its squeaking door.” This kitchen backdrop hosted nearly all of Child’s 1990s television series. For her work on television, Julia won a George Foster Peabody Award, seven Emmy Awards, and five additional Emmy nominations. She also won a National Book Award for one of the 18 books she either wrote or co-authored. On July 23, 2003, in a White House ceremony, President George W. Bush bestowed upon Julia the Presidential Medal of Freedom, America’s highest civilian award.